Regardless of your budget, there are options available to you when it comes to creating your own webinar or webinar series. Webinars are an increasingly popular form of teaching process, updating employees on company on-goings, holding meetings, informing employees or an audience of what’s to come, or even just touching base with multiple people at once. There are many reasons to hold a webinar, and each is as beneficial as the next. Consider why you believe you need the webinar. Do you need to reach a large audience? Does the webinar include people all over the world, or just in your city? If you’re trying to reach an international audience, you may have to consider additional costs like translators. 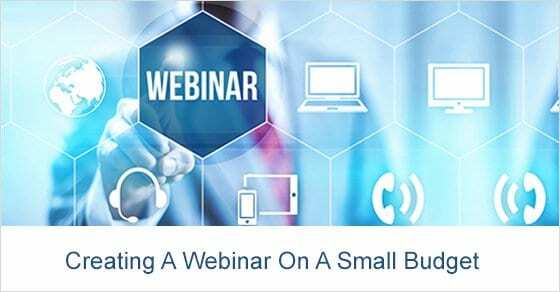 Keeping your first webinar targeted towards a smaller audience will help simplify the process and keep costs down. Have other employees on-board. You will need people to help create, organize, monitor, and present certain facets of the webinar. The more hands on-board from your own company, the less you’ll have to outsource to production and editing companies. Use your internal resources first! Ask who has camera experience and whether anyone knows how to use editing software. Determine how you would like the webinar to go. Creating a format that is easy to understand and follow is important. You will want the audience to understand what is happening and what is being told or taught. Create a fluid format for an increase in retention. The more you know your material, the less likely you’ll have to re-shoot it, saving you time and money. Come up with visuals! Visuals are a very important part of a webinar. Include slides, presenters, screen grabs, and other similar facets when possible. With all of the webinar tools out there, you will need to decide which one will best suit your specific needs and budget. Find tools that are tailored towards your needs. Decide on what features you will need and how the audio is handled. Some of the web tools you find will offer web streaming audio, but for those that don’t, you will need to find a way to interact with those in the webinar. If you’re doing a live webinar, record it so it can be reused in the future. This will potentially save you from added expenses down the line. If your webinar is live, schedule a practice run before the webinar is set to be released. With the help of a few peers, do a test run to assure that everything is as it should be and functioning properly. Make sure you have all of the right equipment. Headphones, microphones, power cords, networking cables, and other useful tools will need to be ready, and can be found second-hand on websites like eBay or Amazon. This will reduce costs and will still allow you to have high quality. You will want to make sure that you create enough publicity for the webinar. Set a date to conduct the web seminar and then promote it wisely and well. Send out emails, create competitions, use social media platforms, and your website to create a well performed promotion.